We can all be grateful that ECM’s new reissue series, Re:solutions, has begun to bring to light some of the signature releases from earlier in the label’s history. Perhaps the most adventurous of the lot so far is Contrasts, in which we get to hear a veteran ensemble of creative improvisers at the peak of their powers. 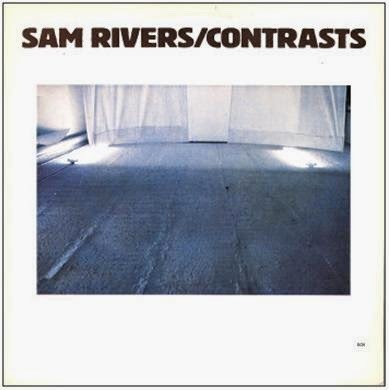 This was officially Sam Rivers’ release, but it was truly a joint endeavor, involving Rivers (on soprano and tenor saxophone and flute), his frequent collaborator Dave Holland (bass), and Thurman Barker (drums, marimba) and George Lewis (trombone). Rivers, Holland and Barker had previously recorded together just a couple years prior, on Rivers’ Waves, so one would expect this band to be tight, and it is, with Holland and Barker clearly able to sense each other’s moves and stay in constant conversation, even while keeping an open and flexible rhythmic feel to the record’s seven tracks. The album’s opener, “Circles,” begins with all four musicians exploring a range of ideas in close rapport; it’s the freest of the seven tracks, and it’s a great avenue for listening to each musician respond sympathetically to the offerings of the others. Holland is at his best and most lyrical here, playing sinuous arco melodies as Barker pounds out powerful interjections to respond to Lewis and Rivers, both of whom alternate between longer flurries of notes and shorter bursts. Lewis in particular seems inclined to push the track into a kind of march at times, with brief repeated phrases, and as the track unfolds Barker keeps the track moving along almost exclusively using his toms and snare, with little reliance on his cymbals. It’s a great glimpse of an open-ended improvisation that seems grounded in a shared understanding—almost sounding composed, but with enough fluidity to keep one guessing what’s coming next. The other tracks provide a lot of variety, with “Zip,” the second track, providing a much more conventional complexly written post-bop head, giving us a chance to hear the band cook with some spirited blowing from Rivers on tenor. Hearing Holland and Barker lock in on this one is exciting indeed. “Solace” offers a languid, mysterious exploration, with Barker mostly on marimba and some great mutual interaction between Rivers and Lewis. Then on “Verve,” the band settles in with a funky, latin-flavored groove that offers a nice change of pace from the somewhat less structured previous track, and features Rivers at his most accessible, this time on flute. And the remaining three tracks are equally challenging, intriguing, and stimulating, as these musicians offer a great deal to absorb in just over forty minutes. Perhaps the highlight of the last half of the record is the brilliant (and appropriately titled) “Dazzle,” which features some truly fiery playing by Rivers, Lewis and Holland. Let’s hope that ECM has a lot more of these reissues in the works, as it’s a great opportunity to witness the label’s sometimes under-recognized contribution to the development of the jazz avant-garde during this formative period. Bought this LP used a few years ago and love it. One of my favorite of Sam's.